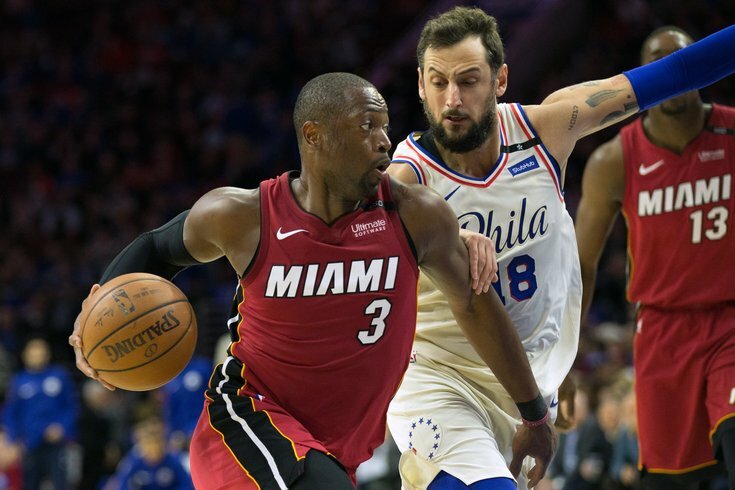 Miami Heat guard Dwyane Wade drives against Philadelphia 76ers guard Marco Belinelli during the second quarter of Game 2. After an emphatic 27-point win in the series opener, the Sixers dropped Game 2, 113-103, to the Heat at the Wells Fargo Center on Monday night, snapping their 17-game win streak in the process. After hitting a franchise-record 18 three pointers on Saturday night, Philly struggled from outside, hitting just seven of their 36 attempts. Ben Simmons led all Sixers with 24-8-8 while Dario Saric added 23 points, nine rebounds and five steals. But it was Dwyane Wade who stole the show with 28 points off the bench for the Heat on 11-of-17 shooting. James Johnson was even more efficient, scoring 18 points on 7-of-7 shooting and adding seven rebounds, five assists and three steals. Game 3 will take place Thursday night in Miami. FROM EARLIER: Fresh off a convincing win on Saturday night, the Sixers are back in action against the Miami Heat with a chance to go up 2-0. Joel Embiid may not be back in the mix yet, but with Ben Simmons and Co. rolling, Brett Brown's squad is in prime position to take an iron grip of the series. Follow along with us below, where we'll provide updates via Tweets, video, and more throughout the game.